The concept of having bathrooms in their house was quite unknown to the Victorian people. The system of public baths was common where people would go. 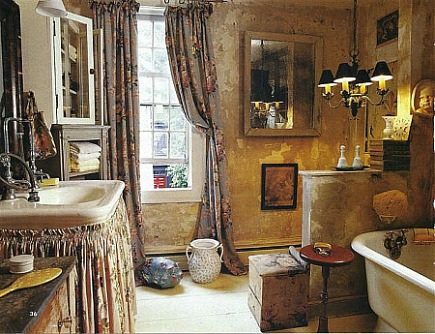 However, despite this bathrooms were found for the first time in the homes of the upper-class. This was the case because the plumbing and fixtures required for constructing an indoor bathroom were extremely expensive. In most of the Victorian houses, the bathrooms consisted of bathtubs which were attached to a gas water heater. The use of water heater was considered by some as an improvement to the concept of a bath. Despite its usefulness, the heaters had the probability of exploding and for this very reason, many people avoided using the water heaters. The houses in which there were no water heaters would heat the water for a bath in the kitchen and carried it all the way up to the bathroom. The bathrooms in many Victorian homes had porcelain tiles. The toilet or water closet as it was known was invented sometime around 1596 by an Englishman. The toilets in some of the homes were separated from the bathrooms as the lack of proper water trap, it gave out an unbearable smell. These water closets were also ornamented. The bathrooms were lighted with the help of Sconces. The clawfoot tub is a classic example of Victorian bathtubs. Clawfoot tub was popular since it did not occupy much space and more importantly, the Victorian bathrooms were small and so this tub could easily fit in the bathroom. The clawfoot tub in the later years was painted with gold. The bathrooms even had sinks which were pedestal shaped, that were either the round sinks or the square ones. There were many sinks plugged in directly to the wall and thus there was no need for a stand. The tubs and sinks were often covered with wooden surroundings to make it look like a piece of furniture. In some homes, sinks and toilets were hand-painted in a floral pattern and in sea figures. Other items that completed a Victorian bathroom were shaving stands, small tables, a small sitting area if the bathroom was big enough, huge painted mirrors, brass fixtures, wooden panels and gas lights.